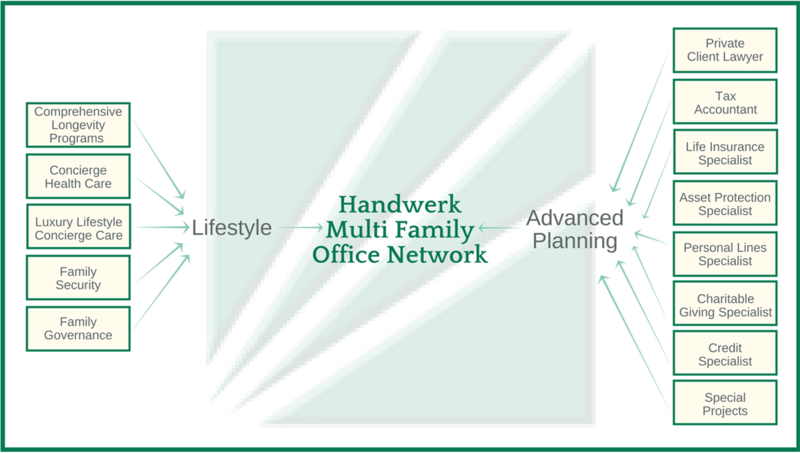 At Handwerk MFO we work with affluent families and small, privately-held business owners who are seeking to grow and protect their wealth. In most cases, having a customized wealth strategy can be more valuable in reaching your goals than an investment plan alone. Our model is not to replace your existing professional advisors, including your lawyers, tax professionals, real estate agents or accountants. Instead, we act as a Personal CFO, to coordinate and interact with all your existing consultants to help eliminate unnecessary or unsuccessful processes and to lend a new perspective and cohesiveness to your professional team. We will work in a collaborative fashion to craft a set of strategies specific to your needs, and which may involve some or many of our more than 20 services. In the end your wealth puzzle will fit together, and your wealth picture will be clear. Your strategies will be synergistic, all working toward the same goals, and you will finally have a truly diversified portfolio of investments, beyond the typical collection of stocks and bonds.